Days #2-10 through #2-15 (Spiritday, 10th Thawmist, through Spiritday, 15th Thawmist, 4333 BCCC): Since their recent return from Losnoth, the party of Falafela, Lightstep, Opalent, Vandin Lakesplitter, Vox the Just, along with their dwarf pals Persis and Tureg, rested in the two cabins near Breathy’s inn near the citadel of Elwood the Blue. They put in orders through Elwood for the supply wagon from Popinjay to bring them some wineskins, as Falafela, Vandin, and Vox lacked any means of carrying water. Lightstep also ordered and received a sling and 12 sling bullets. This message was delivered to Popinjay by the regular messenger service between Elwood and Popinjay. When the weekly supply wagon arrived at Elwood’s citadel from Popinjay, a human cleric, Pangborn, arrived along with the ordered merchandise. Pangborn had been sent by Hawkmoon to get some first-hand experience with what was going on at Losnoth. Also while at the cabins, the halflings Falafela and Lightstep, with help from Breathy’s daughters Gertrude and Shannowy, shortened their black cloaks that were brought back from Losnoth, as adult-length cloaks would have been too long for those two halflings. During this interlude, a bit of game “housekeeping” took place. The characters all rolled dice for age, height, and weight, which caused some adjustments to their basic characteristics. 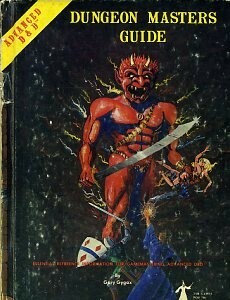 The age rolls were as from pages 12 and 13 of the 1st Edition AD&D Dungeon Masters Guide. Height and weight were determined from the tables on page 102 of that same DM Guide. Falafela is 44 years old (mature halfling, add 1 point each of strength and wisdom), 2’8” and 40 lbs. Lightstep is 27 (young adult halfling, subtract 1 point of wisdom, add 1 point of constitution), 3’1”, 55 lbs. Opalent is 167 (young adult elf, subtract 1 point of wisdom, add 1 point of constitution), 6’1”, 115 lbs. Vandin is 50 (young adult dwarf, subtract 1 point of wisdom, add 1 point of constitution), 3’4”, 120 lbs. Vox is 17 (young adult human, subtract 1 point of wisdom, add 1 point of constitution), 5’7”, 160 lbs. I suppose I should explain the notation of such as “Day #2-10” etc. A long time ago (i.e., around 1980) when I DM’ed for Dungeons & Dragons, I kept a sort of journal of what days the adventurers were active. And especially because there were more than one group of adventurers, I needed to keep the chronology to keep straight what happened when. If one group went into a dungeon on day 3 and found some particular treasure and removed it from the dungeon, a different party visiting that dungeon on day 6 would not be able to find that same treasure. Back then I just called the days “day 1” or “day 5”, etc, so when I started the new campaign in 2015 I decided to preface the day numbers with “Year 2”, hence now the days are known as “Day #2-10”, and so forth. This entry was posted on Saturday, December 19th, 2015 at 11:33 am	and is filed under Dungeons & Dragons, Role-Playing Games. You can follow any responses to this entry through the RSS 2.0 feed. Both comments and pings are currently closed.